The newest of the NHL's individual trophies is the Maurice 'Rocket' Richard Trophy. Appropriately, the award is presented annually to the goal-scoring leader during the regular season. 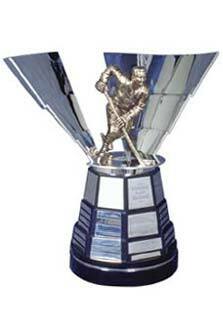 The Rocket Richard Trophy was donated by the Montreal Canadiens hockey club in 1999 to honour their outstanding star and ambassador, Maurice 'Rocket' Richard. Maurice Richard spent his entire 18-season career with the Montreal Canadiens, his hometown team. Richard led the NHL in goal scoring on five occasions. In 1944-45, Rocket Richard became the first NHL player to collect 50 goals in one season, scoring them in 50 games. The first winner of the Maurice "Rocket" Richard Trophy was Teemu Selanne of the Mighty Ducks of Anaheim for the 1998-99 season. Multiple winners: Alexander Ovechkin (7), Pavel Bure, Jarome Iginla, Steven Stamkos (2). During his incredible career, Richard celebrated eight Stanley Cup championships. Maurice 'Rocket' Richard retired after the 1959-60 season, having recorded a then-record 544 goals.